OLF elementary joined the annual celebration started by St. Francis of Assisi almost 800 years ago: blessing our animals. It was Francis who first introduced the idea that human beings are only one of a myriad of creations of God and all are blessed in God’s “eyes”. The feast day of St. Francis is celebrated every year on October 4, and OLF elementary pays tribute to St. Francis by blessing the pets of the students. 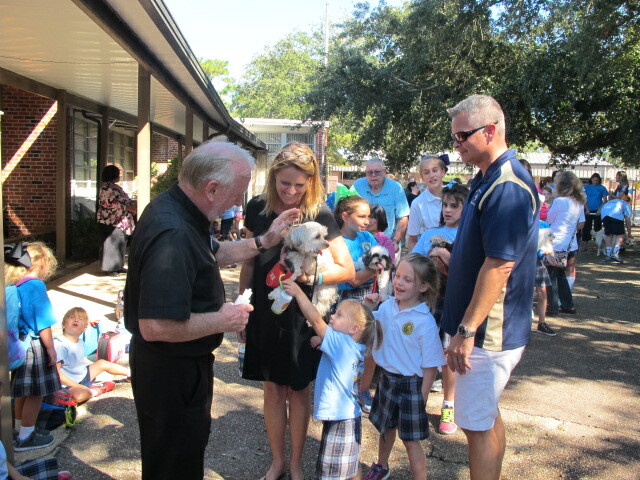 This year more than 25+ pets lined the school assembly area as Father Henry McInerney gave out the blessings. The animals ranged from dogs, cats, and even pet fish. One participant said “they are just as much as part of our family as anybody else can be”. More pet photos can be found in Seen & Heard.